Our family recently returned from a trip to Spain and I have to say it was one of the best family vacations we've had. We experienced a lot, but instead of cramming all of the highlights into one huge post I am going to focus on one topic per post. This post is all about FOOD. 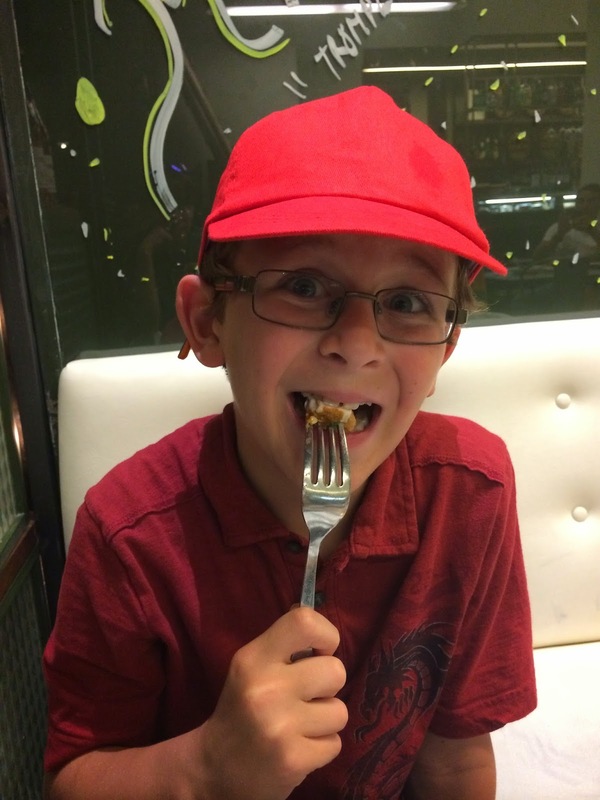 We traveled in June and our visit started in Malaga, in Andalucia and toured the south of Spain for about a week and then took a train to Barcelona for another week. Our hotel in Malaga, the Tryp Guadalmar, was right on the beach. This area of Spain is also known as Costa del Sol. It was sunny, but also quite dry so not unbearably hot. 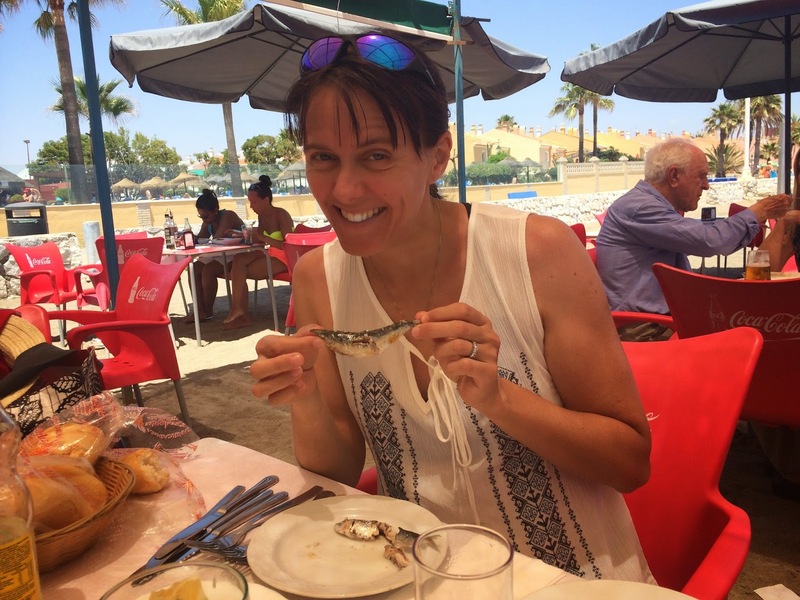 Being right on the beach gave us ample opportunity to enjoy the fresh seafood at our local chiringuito, or beach cafe. The staff didn't speak much English, but the menu did have English translations, and I was not afraid to put my six years of Spanish classes to work…even though I took those classes almost two decades ago. 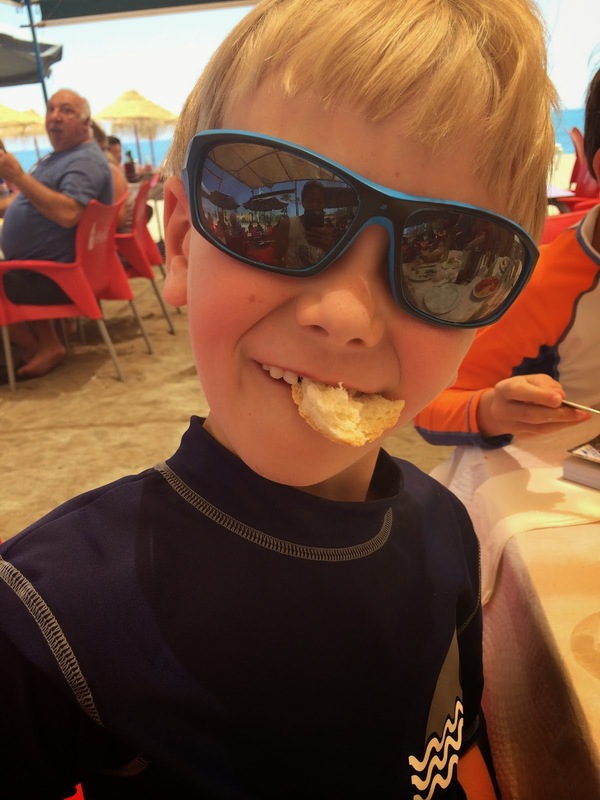 We ate several meals at the Chiringuito Servando and enjoyed each one. We had our first sardines (sardinas) and anchovies (boquerones) here, and enjoyed tasty tomatoes and olives, too. The drink of this region was the tanto de verano, or summer wine. I also enjoyed a glass of sweet wine, but found it a little too sweet for the warm weather. Each person dining received a rather large bread roll, which I eventually declined because some in our party were only eating bread and then whining they were hungry thirty minutes later. While we didn't get any pulpo (octopus) at this chiringuito, we did enjoy clams and of course lots of helado. A few blocks away from our hotel were three little restaurants we also enjoyed. Tick Tack served up an amazing paella and excellent Copa del Mundial viewing. Next to Tick Tack was El Rincon, where we dove into yet another helping of paella and more boquerones. My youngest loved the little fried fishes with a generous squeeze of lemon on top. We had a rental car and that made it easy to visit various places around the Andalucia (pronounced "Andaluthia") and enjoy even more food! 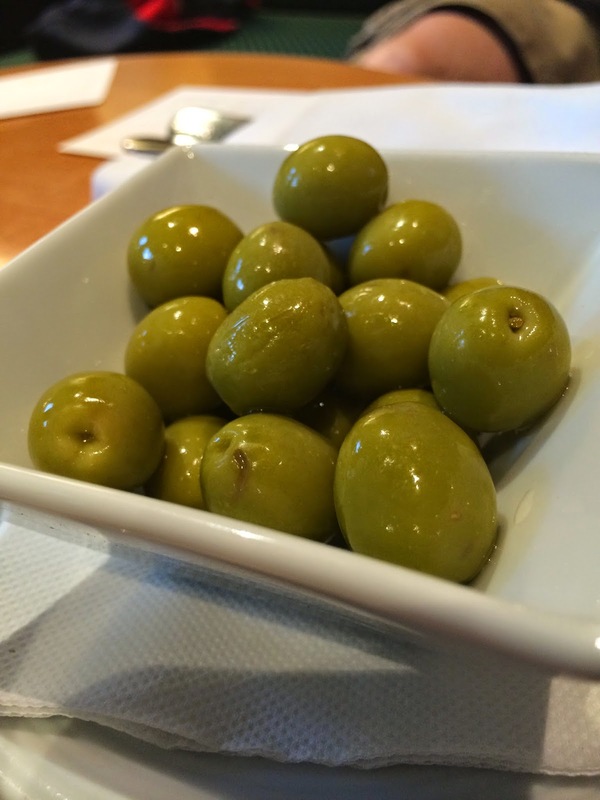 I'm not sure if it was the altitude or the brass band playing in the bull fighting ring, but we enjoyed some of the best olives (aceitunas) at the small cafe in the Castillo in Malaga. Don't get me wrong, the olives all over Spain were incredible, but for some reason these stood out in terms of tangy flavor. Also in Malaga we enjoyed a nice Moroccan meal at a tea house called La Teteria right by the Museo de Picasso, but unfortunately the amazing tea that I ordered never arrived! So I can't say if the tea was any good. Outside of Malaga, there is one little town I recommend you visit to find one little tapas place. 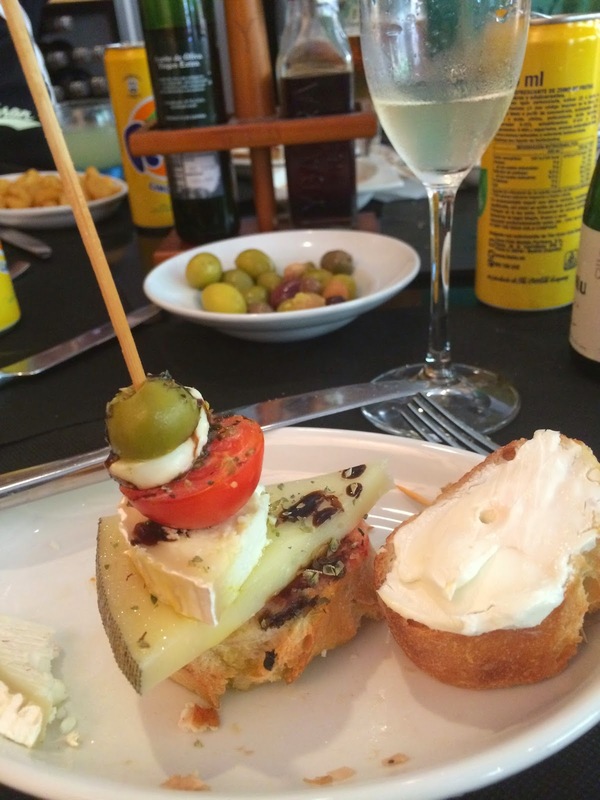 Go to Antequerra and eat at Arte de Tapas. Here is a photo of us toasting our arrival at the highly satisfying dining establishment. My boys were happy to start with water after a hot day, but their go-to beverage was Fanta Limon. Now when it comes to food at Arte de Tapas, you can order the tangy almendras soup I couldn't quite finish, or you can order the tuna salad my oldest son adored, but you must, must, must get the lomo. In fact, get it twice like we did. And you can say gracias (or "grathia") later. On to Barcelona! After such delicious food in the south, we wondered what Barcelona would serve up. It did not disappoint. Our hotel, the Princesa Sofia, located conveniently close to Camp Nou FC Barcelona's home stadium, served a typical Spanish buffet breakfast. Their coffee offerings were a bit fancier than I was used to, but I adjusted quickly. 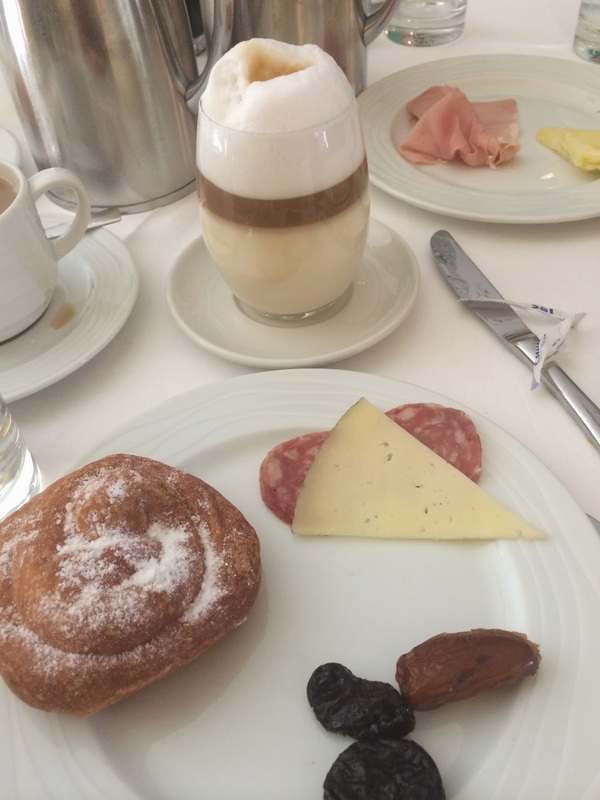 I didn't get a photo of the xuxos, a creamy sweet croissant style pastry, but I adjusted to eating those, too! In the Gothic Quarter, we indulged in chocolate from Fargas where you must get a bag of catanies, and caramels from Papa Bubble. 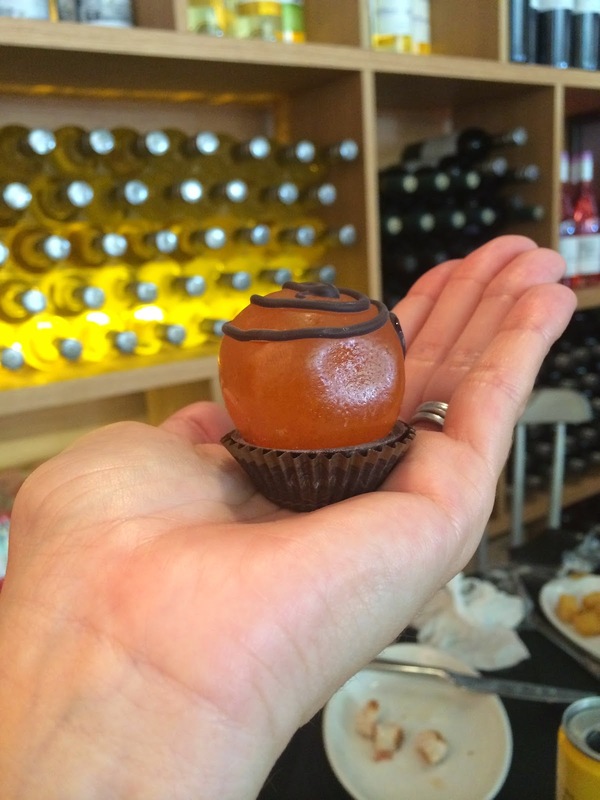 The large orange with a swirl of chocolate on it in the photo is from Fargas and was so sweet everyone in my family took one bite each and said they were overwhelmed. Barcelona doesn't skimp on anything, including flavor. Also in the Gothic Quarter, we had a delightful lunch at a place called Gabriels that served a fantastic selection of monteditos. Monteditos are little sandwiches and places like Gabriels offer a mouth-watering variety. You can order a set of 5 or 10 and take your pick of their whole selection! Wash it down with some dry cava (sparking wine) and you're ready to tackle the next tourist destination. If you get a bit peckish while you're exploring, or perhaps you need a protein boost while viewing the city from the heights of Tibidabo, then you must find the nearest Enrique Tomas store or stall and get yourself some ham in a cone. Yes, even picky eaters love this ham in a cone. My son described it as "bacon mixed with ham." 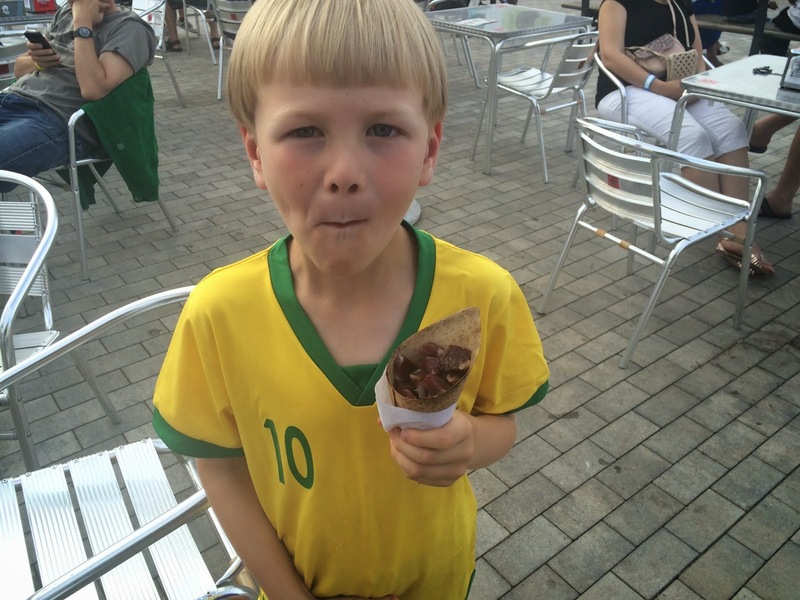 He was happy to enjoy it in his Neymar Jr. jersey before the back injury when all still seemed right with the world. The whole family fell in love with Creps Barcelona, and it turned out to be the only place we ate at twice in Barcelona, if you don't count the hotel. The chips and cheese we ordered was crisp and delicious, the cheese came in a little honey-sweetened oil, and my four-year-old asked delightedly if we were eating bark. 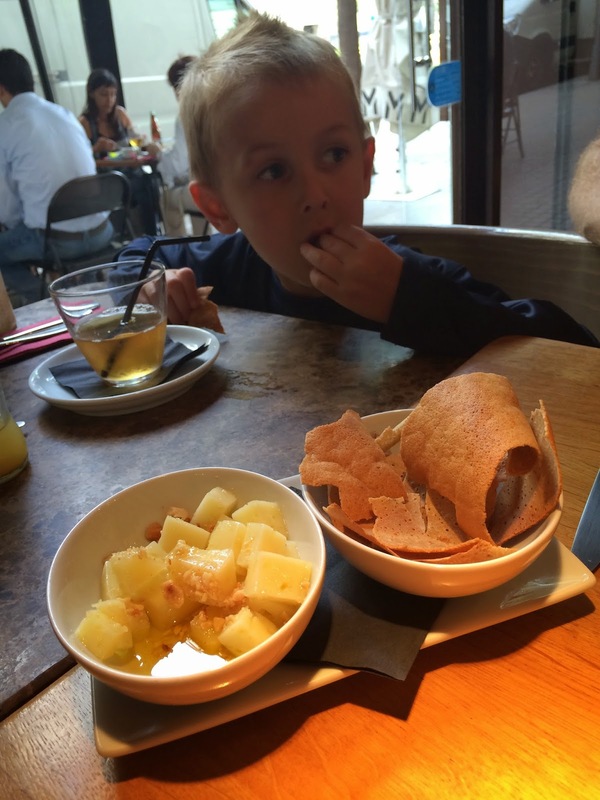 Each boy found something they really loved to eat while we were in Spain, and for my oldest son it was all about patates bravas. At first he took them plain and only dipped them in mayo, but then he started to enjoy them with the various versions of the bravas sauce served at each restaurant. After a long day of hiking, shopping, eating, and snapping photos, Mom and Dad needed to relax with a classic cocktail. Thankfully Barcelona has developed a delicious habit with gin and I was able to experiment with some delightful varieties of gin and tonic. And thanks to duty-free we were able to bring home some of my favorite gins! Alas, the ham we tried to bring home suffered a terrible fate. I get sad just thinking about it. Farewell, delicious ham. And thanks for the food memories, Spain.